Why go to the cinema, if you can bring the cinema to you? 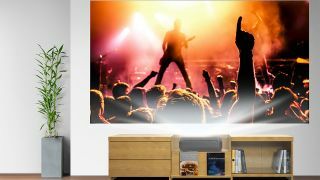 Epson wants to put a giant 120-inch display in your home this fall without breaking the bank with its new Home Cinema LS100 Digital Laser Display. It's essentially a short-throw projector, but Epson's using a different sort of technology to create that whopping image. Rather than using a traditional lamp, it's using laser technology. That's great for two reasons. Firstly, it means the projector is good for 20,000 hours – roughly ten years of use at around 4 hours a day. Secondly, if you've got a decent quality projection screen to throw it onto, you'll get as vibrant a quality picture (in daylight, no less) as an LCD display. The other numbers read well too – 4,000 lumens of brightness help push that impressive daytime viewing capability, a 2,500,000:1 contrast ratio should deliver deep blacks and Epson's 3LCD technology should mean you've no color wheels to worry about or annoying rainbow effect. You've 3 HDMI inputs too, letting you hook up a trio of devices. There's an elephant in the room though, and that's resolution. As the home cinema world moves to a 4K standard, the LS100 is stuck at a relatively lowly Full HD. Who knows what A/V delights will exist by the end of its 10 year lifespan, given it's already a step behind. But that's probably why you can pick it up relatively affordably, as far as short-throw projectors go. The Epson Home Cinema LS100 Digital Laser Display goes on sale this fall for a dollar shy of $3,000. That's roughly £2,300, or AU$3,760, though we're still waiting on availability details for territories outside the USA.